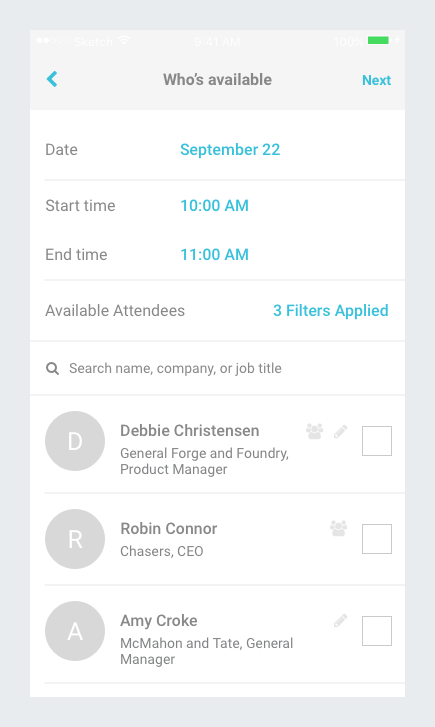 esocial is part of etouches, a sweeping suite of applications used to manage corporate events for large businesses. 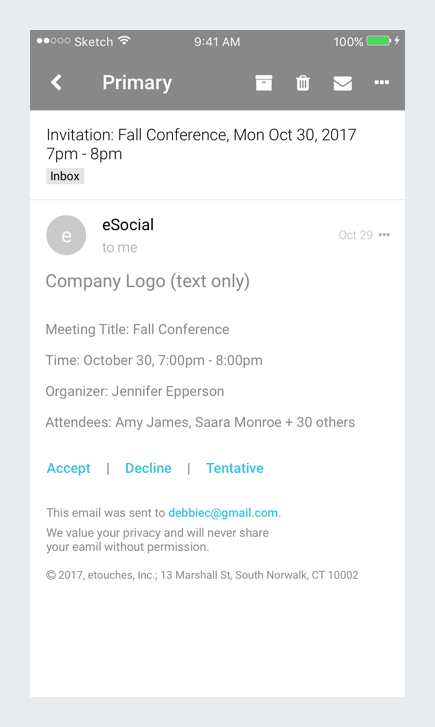 As a result of customer request, the etouches product team decided that the ability to quickly and easily schedule meetings was a design priority. Since this project had a clearly defined objective (and I was a contract designer) and the organization was user research- averse, I relied on customer data the company already possessed to get started. I conducted a few UX whiteboarding sessions to inform the over user flow for the meeting experience, and trusted that I'd develop buy- in for usability testing when it mattered most later in the process. With a more solid understanding of how the meetings functionality should work, I created detailed wireframes and presented them as prototypes to get impactful feedback as quickly as possible. This seamless feedback process convinced product leaders to let me conduct usability testing onsite, which was extremely illuminating and helpful for the remaining design effort. This experience also needed to be responsive from mobile phone to desktop. All screens included responsive mockups as well. The company maintained relationships with several offshore design firms, so it wasn't clear who would ultimately own the visual design. Knowing that some things may get lost in design translation, I added visual design for key screens to serve as a guide for the overall visual design process. 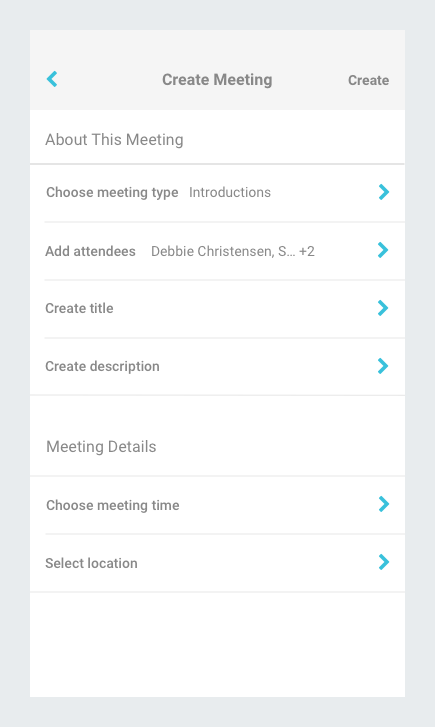 I was able to equip etouches with a product that simplified an otherwise complicated approach to scheduling meetings with fellow event attendees. 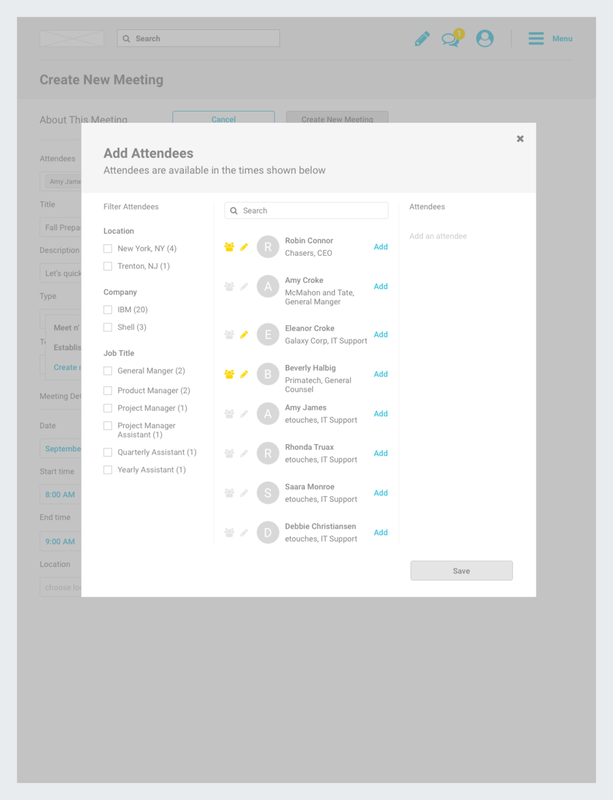 With this UX design, etouches knows that any event attendee can easily learn how to use this tool.